As professional licensed massage therapists, we practice a variety of techniques including: Swedish massage, sports massage, prenatal and postpartum massage, infant and youth massage. Certain Therapists offer Cranio-Sacral Therapy. Some of our therapists are trained in addressing the deeper layers of tissues commonly referred to as “Deep Tissue” massage*. * "Deep" is a subjective term. All Therapist can provide firm to medium-deep pressure. Please let us know when booking if you are interested in a Deep Tissue session, so we can assign an appropriate Therapist if available. Although we do not charge more for Deep Tissue, we suggest a generous tip for your Therapist. We strictly follow draping protocols and offer only therapeutic modalities. Some treatments are available at your location in the Taos area for an additional fee. In consideration of our chemical-sensitive Clients, we are a perfume-free environment. Thank you. A heavenly combination of massage therapy, heated River Rocks and our Revitalizing Facial. The smooth warmth of the stones combined with massage therapy help to melt away tension. Then the Revitalizing Facial will hydrate and nourish your skin. Your body and soul will thank you. Two wonderful hours... ahhhhhhhh! Professional therapeutic massage promotes deep relaxation, renews vital energy and accelerates your natural healing process. Our Licensed Massage Therapists are trained in various modalities such as Swedish massage, Deep Tissue, Sports Massage, Prenatal Massage and more. We use lotion for better skin hydration and to protect your clothing from oils. You can add Aromatherapy into any session for an additional $10. What is AROMATHERAPY ? Essential oils extracted from plants and resins have many health benefits. We use pure single oils and blends of oils that nourish your mind and body. You select from our collection of essential oils by smelling the magical scents. You might be drawn to a refreshing floral blend or a calming earthy fragrance. "Aroma - Therapy" ... therapy for the whole body engaging the sense of smell. "The nose knows!" PHOTO: Prenatal Massage Therapy helps both Mom and Baby. Combined with experienced massage, smooth river rocks magically release stress and tension from body and mind. The stone's heat penetrates muscles to melt away tension. For those preferring to de-stress and thoroughly relax, we use gentle motions with the stones. For those preferring deep bodywork, the stones soften the surface muscles allowing your therapist to work deeper. Experience this unique massage! Our classic spa facial is performed by Licensed Massage Therapists and is combined with massage. We use warm towels to relax the face and open the pores. Then a gentle cleanser (Andalou Naturals) prepares the skin to fully absorb the essential oil aromatherapy mask---our locally crafted custom blend with argan oil. Andalou toner and cream deeply hydrate and nourish your skin. Face massage and hydration helps to minimize appearance of wrinkles to bring out your natural beauty and a dewy fresh feeling. The 1 1/2 hour session includes full body massage. Let us nurture your eyes with gentle, relaxing massage and acupressure. Are your eyes irritated by allergies or tired from computer screen fatigue You'll enjoy soothing herbal eye care that's designed to give you a new and refreshing outlook. As part of your massage session, we'll pamper you with warm, herbal towels that relieve tired or aching feet. We massage out the kinks and even do foot reflexology to re-energize not only your feet, but your whole body. Give your feet a luxurious treat! Only $40 if added into any other treatment (no additional time). Detoxify while aromatherapy steam penetrates your muscles. Your face remains cool as you indulge in a head and neck massage. After steaming, we continue with a full body massage. What is AROMATHERAPY ? Essential oils extracted from plants and resins have many health benefits. We use pure single oils and blends of oils that nourish your mind and body. You get to select your Aromatherapy from our collection of essential oils by smelling the magical scents. You might be drawn to a refreshing floral blend or a calming earthy fragrance. "Aroma - Therapy" ... therapy for the whole body engaging the sense of smell. "The nose knows!" You rest on the Biomat® Pro with the Biomat® Mini on top of your torso which we call the "Crystal Cocoon". You relax with some quiet time absorbing the healing infrared rays and negative ions. Then enjoy your massage while still upon the larger Biomat®. Deeply relaxing yet also cleansing at a cellular level with the infra-red rays that improve blood and lymph circulation. You rest on the Biomat® Pro with the Biomat® Mini on top of your torso which we call the "Crystal Cocoon". You relax with some quiet time absorbing the healing infrared rays and negative ions. Then enjoy your 1 hour massage while still upon the larger Biomat®. Deeply relaxing yet also cleansing at a cellular level with the infra-red rays that improve blood and lymph circulation. You rest on the Biomat® Pro with the Biomat® Mini on top of your torso. You relax with some quiet time absorbing the healing infrared rays and negative ions. Then enjoy your 1.5 hour massage while still upon the larger Biomat®. Deeply relaxing yet also has a gentle cleansing affect! You rest on the Biomat® Pro with the Biomat® Mini on top of your torso. You relax with quiet time absorbing the healing infrared rays and negative ions. You rest on the Biomat® Pro with the Biomat® Mini on top of your torso for up to 20 minutes before any treatment of your choice such as Revitalizing Spa Facial. Soaking your feet in warm water, the Ion Foot Spa draws out metabolic waste through the largest pores on the body which are on the soles of the feet. As the water changes colors, you see how the liver, the lymph system, and/or kidneys are clearing out debris. Clients experience benefits such as reduced inflammation, reduced joint pain and even softer skin. The Bio Energetic Synchronization Technique (B.E.S.T.) is widely used by health care practitioners all over the world who practice mind/body healing, and who recognize the body is more than the sum of its parts. This system of health care is truly state-of-the-art in balancing body/mind/memory/soul energy fields by removing interference between your body and the power that made your body. When this interference exists, symptoms develop and health deteriorates. Comfort Touch is offered by Kyoko Hummel. This gentle acupressure modality is perfect for our Elders or any other special needs clients. The client may remain fully clothed. 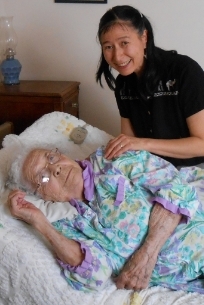 Comfort Touch is a nurturing style of acupressure developed by Mary Kathleen Rose, to be safe, appropriate and effective for the elderly, the ill, and anyone in need of a caring touch. It is ideally suited for on-site massage, as it is deeply relaxing, yet energizing, and it can be practiced in any setting.